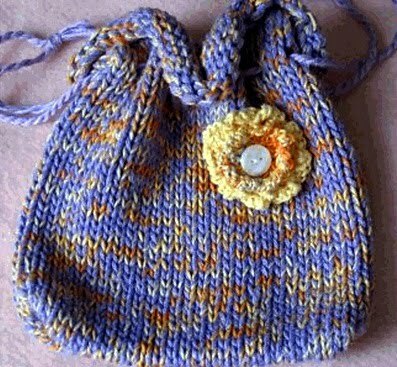 This bag is knit in the round on circular needles holding two strands of yarn together to create an interesting color and to make it thick and sturdy. The dimensions are 7" wide and 8" long. The flower was knit using a pattern inspired by the book Vintage Hearts & Flowers. Knit one row, slip on a place marker and then join the yarn. Knit until bag measures 3 inches. At place marker, knit an eyelet round: *K3, YO, K2TOG*. Continue knitting until bag measures 8 inches from cast on edge. Bind off using the three-needle bind off method. Or, you could use your preferred bind-off method and then seam the bottom of the bag using mattress stitch. Make a twisted cord drawstring. Thread the drawstring through the eyelets of the bag. Embellish with knit or crochet flower. Any questions, please leave a comment or send me an email. I can't wait to try this, thanks so much for sharing! Awwww... It's so cute. I think it's a little out of my league, though. Circular needles? Bah! I wouldn't know where to start. Looking forward to knitting this, I'm 3/4 way finished knitting a sweater vest using patons grace tangelo and was happy to see a pattern using the same yarn/color, it does have a nice stretch to it, it is soft and pretty. Do you continue eyelet round til the bag is finished? or is it one row of eyelet? Thanks, can't wait to make these for my little granddaughters for Christmas. Thank you for this pattern; can't wait to make a few for my granddaughters in pink and purple. Do you continue in eyelet rows after the one? There is just one eyelet row. Glad you like the pattern. I double checked my stitch counts and work. The eyelet pattern did not finishe correctly. I just wanted to verify the pattern was correct. Thanks!